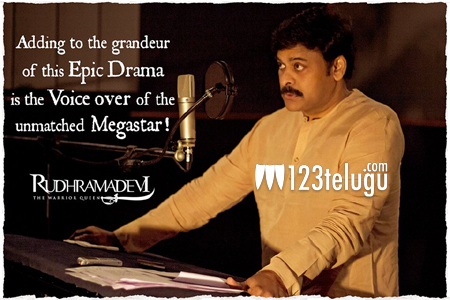 It is a known fact that mega star Chiranjeevi has done a voice over for Rudram Devi. The makers of the film have released a new teaser saluting the legendary actor for his contribution to the film. As soon as the video went viral, there was a huge buzz in the social media. Chiranjeevi’s husky voice would definitely be an added advantage for the film which has suddenly caught up pace with this video. Rudrama Devi is the first 3D historic Indian film to be ever made. Some big names like Allu Arjun​ and Rana Daggubati are also involved in this project which has music by Ilayaraja.